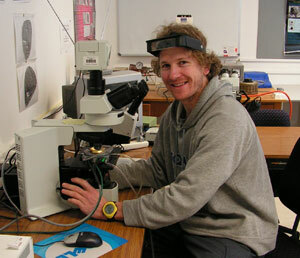 Adam Bath began his earth science studies at the University of Newcastle in 1999 and was awarded with a B.Sc in 2003. In 2000 Adam was awarded a scholarship to study at the University of Victoria (Canada), and while on exchange Adam was employed by the University of Victoria and British Columbia Geological Survey Branch as a field assistant. As a field assistant Adam was involved in a TGI-funded bedrock mapping project within the Atlin area during the summer of 2002. Between 2004 and 2005 Adam completed a B.Sc (HONS) at the University of Tasmania. The honours research project was on the geochemistry of the Gawler Range Volcanics, South Australia. The PhD project aims to answer a number of key questions relating to the transportation and deposition of Cu within the Mount Polley and Lorraine alkalic porphyry deposits. At both deposits Cu-Fe sulfides occur in association with apatite, and whole rock geochemistry from the Mount Polley deposit demonstrates that there is a strong positive correlation between phosphorous and copper, suggesting that these elements may couple during transportation and deposition. The study has demonstrated that apatite in Cu-Fe sulfide ore at Mount Polley crystallized with Cu-Fe sulfide ore and that apatites have &#949;Nd and &#949;Sr values consistent with a depleted mantle source. The study also shows that apatite associated with Cu-Fe ore have S-rich cores and comparatively S-poor rims suggesting that there was a decrease in the activity of S+6 during the crystallization of apatite and/or an increase in the activity of P, which are important clues towards understanding the relative activity of oxidized species during mineralization. Future work will focus on sulfate and primary and secondary fluid inclusions within apatite to better understand the composition and trapping temperature of fluids that were associated with apatite crystallization and ore-deposition. This work should improve our understanding of processes occurring during ore deposition and thus lead to better exploration models.